Hampshire made the perfect start in their bid for a third successive Twickenham appearance. Ian Chandler’s troops delivered an impressive 56-35 Bill Beaumont County Championship curtain-raiser win over North Midlands at Gosport Park on Saturday. The home side scored eight tries on their way to a well-deserved victory. Chandler was delighted with the manner of his team’s success. The coach said: ‘It was better than we could ever have expected. ‘We brought in seven new players and they all fitted in well and made good contributions. ‘North Midlands wanted to play a set-piece orientated game. ‘Eventually, though, we battled hard to negate their main weapons. ‘We won it with our speed and mobility with our backs putting in an awesome display. ‘Our centre, Joel Knight, was man of the match by a country mile. ‘He gave the almost-perfect performance, tackling well and running hard at the opposition. ‘His ability allowed us to dominate in the midfield. Hampshire raced out of the blocks with a second-minute penalty from Grant Hancox. Two tries quickly followed, the first from Havant ace Knight and another from Curtis Barnes. The Portsmouth winger won the battle for the touchdown following a clever and calculated cross-field chip from Knight. It was Barnes’ last action of the game, however, as he limped off with a hamstring injury and was replaced by Jake Caddy. The visitors hit back with a try but Hampshire extended their control with two more of their own. Caddy showed a great turn of speed to score and Knight powered in for his second of the match. Hancox converted both and also knocked over a penalty to put the hosts firmly in the driving seat. Yet in reply two interception tries breathed new life into North Midlands. Chandler added: ‘All of a sudden we had let our opponents back into the game. ‘We knew we had to tighten things up. In the first half our scrum had come under a bit of pressure so we changed things at half-time. Within two minutes of the restart Hampshire re-established their superiority and made it count. 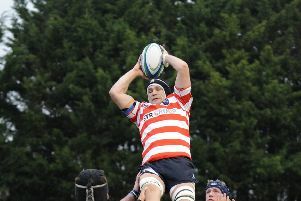 Replacement back-row forward Joe Davis rounded the defence and soon after fellow Havant forward Harrison Young sauntered over for a try. Caddy marked his debut by rounding things off for Hampshire by bringing up the half-century with his second try. In the other pool game, Warwickshire beat Somerset 29-5 at Nuneaton. Hampshire travel to Taunton to play Somerset on Saturday.